A lot of people want to enjoy a trip to France, with the idea of having a nice vacation AND practicing their French. Unfortunately, they often come back saying “As soon as I started to speak, the French would answer to me in English”. Here is my advice on how to pick the right place to practice your French. People in major cities tend to be busy, in a hurry, and they won’t have the time or the interest to chat with foreigners, especially those hesitating and looking for their French words. Many French people speak English in major cities, so put yourself in their shoes: when you have a job to do, a place to be, you don’t want to be rude, but you just don’t have the time! If they speak English, they will most likely try to speed things up and speak English with you. Same reasoning here. Yes, la Provence is lovely, and that is why so many foreigners live there. So chance are you won’t be anything special in Provence… even in small villages: they see so many tourists there, it’s nothing special! However, I promise you that someone from Alaska showing up in a small Brittany village like Jugon-Les-Lacs (where our immersion teacher Suzanne – to the left on the picture – resides) will be a big deal. Actually, you may even make the local news! So make sure your expectations to practice your French with the local fits your destination. December to March is the low tourist season. Plane tickets will be cheaper, and so maybe accommodations. I can guarantee that everybody in the tourist industry will be much happier to see customers than during the rush of late Spring and Summer! France has many, many coast lines, mountains, lakes… and is therefore a major destination for tourists. In the summer, tourists who don’t like the heat go to Brittany, the ones who love it go to Provence. In winter, try a coffee place in a small town of the Dordogne: yes, it may rain outside, but chances are that you’ll be the only customer there and the waiter will be glad to have some company, and will be delighted to talk to you in French! So if you are traveling to France to practice your French, this piece of advice may be the most important of all: travel to France in Winter or Early Spring! I heard many tales of students going off the beaten path, to Lot-et-Garonne for example, or Belle-Ile-en-mer – a preserved island in Southern Brittany, and having the best time of their life. In the deep French countryside, French people don’t usually speak any English and are very happy to encourage the newcomers to communicate with them in French. People are much more relaxed than in larger cities. The sense of welcome is different too: people take time for one another, and seeing a new face is interesting. If you go to remote places in France, you’ll be truly unique: people will come to you to talk, figure out why you went there, where you come from… You may have to hop on a train or two, or rent a car. France is a safe country! Don’t hesitate to be bold and drive away into the French wilderness!! 5 – French Speaking Vacation Tip – Think Club Med! Or going to France maybe too far, too complicated… So why not try “Club Med”? Club med now has “family” clubs, which are kid friendly – although not everybody may agree on what is PC around kids! 6 – What About Québéc? Guadeloupe? French Speaking Switzerland? Many places around the world speak French, like French speaking Switzerland. And people there are usually delighted when they meet foreigners who came to them to practice their French. It may be closer to your home, so the trip will be cheaper. It may also be a destination that your whole family would enjoy – yet you’d still get to practice your French! Of course, the accent may not be exactly the same as French spoken in France, but it’s not a problem – it’s still French! And a good practice for you. Even when you are surrounded by French speaking people, in France, you may end up alone. It’s not easy to start a conversation in French in a coffee or a restaurant. So why not try a French speaking bus tour, or a French cruise? You’ll be part of a group: people will for sure talk to you, and you may be the only foreigner there. Even if you are shy and take time to make friends, the tour guide will be speaking French – that’s a start! There are many B&B in France: although the owners may speak English, they may also understand their guests want to practice their French and be more inclined to do so. Check out this site for addresses. Finally, if you do choose to vacation in France to practice your French, don’t hesitate to clearly say you prefer speaking French. For some reason, French people think that it is polite to speak a foreigner’s native language if they can. They also want to practice their English. Most of them don’t realize you actually may have come to France to practice your French, since a lot of tourists are indeed relieved when someone does speak English. So say that you prefer speaking in French. So say it politely, with a smile, and they should get the message. Check out my article on how to make French people speak French to you for useful sentences and more tips. Here are some tips on how to pick the very best learning method and avoid scams. If you are considering going to France to practice your French, I strongly recommend you check out my “Immersion at a French teacher’s home programs“: French teachers who speak English if needed, will welcome you into their own home. You’ll have lessons in the morning, and time to walk around by yourself or with your teacher in the afternoon. I personally checked their teaching ability and accommodations – they get awesome reviews and are booked months ahead of time, so if you are interested, contact them fast! 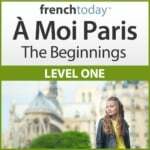 Finally, if you can’t go to France, let France come to you: check out my downloadable French audiobooks to practice French in context. I have written and recorded many fun novels taking place in France, using simple yet truly useful vocabulary, and recording at several speeds to prepare you for modern French pronunciation.